Tobi graduated from the University of Munich in 2004, where he continued working in a veterinary echocardiography research project until 2005. After completing a Small Animal Rotating Internship in Georgia, USA, Tobi worked for one year with the busy cardiology department at the University of Giessen, where he gained a lot of interventional cardiology experience. Tobi then moved to the Royal Veterinary College, London, completing his cardiology residency and attaining his ECVIM-CA(Cardiology) Diploma in 2010. Tobi then joined Southern Counties Veterinary Specialists where he has been working as an European Specialist in Veterinary Cardiology for the last five years. 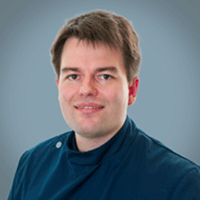 After a brief spell back in Germany, Tobi returned to work full-time as a Specialist in Veterinary Cardiology and continue developing the very successful interventional cardiology service at SCVS. Tobi’s main interest is feline cardiology and interventional cardiology.